Backstory: She was being sold in a produce store. She was pregnant and had another litter with her. She was bought by a guinea pig rescue and had her second litter there. I met her when the babies from the second litter were three weeks old. She had three daughters and a son. Personality: She loves food, has a beautiful smile, and is surprisingly agile for her fatness. She's content for cuddles, and if you scratch her crest she may fall asleep. Backstory: She is Cinnamon's daughter, part of the second litter I met at the rescue. Personality: She spends most of her time sitting like a sphinx, watching people with a judgemental expression. She absolutely loves chin rubs. She is quite a crybaby, and if anyone so much as bumps into her she will start crying loudly and look at you as though to say, "Look how mean they are." She is very slippery and hard to catch - this has earned her the nickname Soap. Personality: She is never happy sitting still and must always explore the world. This has led to multiple escapes over the course of her life. She loves human cuddles and chin rubs. She is quite a devious and chatty little girl. She's not a big fan of other guinea pigs, and can usually be found in a house looking upon the world with a grumpy expression. Personality: She used to be a very angry guinea pig, but since moving to the room cage she has calmed down and no longer picks fights. She likes cuddles and is quite bubbly toward humans. She has become a very tolerant and peaceful girl and will even put up with the other guinea pigs poking around in her face and stealing her food. Backstory: He was kept for two years with four other males, suffering facial injuries and mental trauma. He was taken in and desexed by a shelter, though he still had a huge amount of health problems when I adopted him. It's taken a long time but his health is finally stable. Personality: He is a very sweet boy that loves hanging out with his girlfriends. He has an unhealthy obsession with carrots, hoarding them and throwing a tantrum when they run out. Backstory: Her original owners wanted to travel and surrendered her, along with three other females. They were all pregnant. She gave birth to one daughter and one son. Personality: She is very docile and easy to handle. She loves being on her hindfeet and peering over things, and will often raise herself up and sniff the air so enthusiastically that you have to stop her toppling over. She has social anxiety, and prefers to eat away from the others at dinner time. Backstory: I bought her from a pet store because she had gastrointestinal issues and such severe anxiety that I did not have the heart to leave her there. Personality: She has come a long way in recovering from crippling anxiety; now she is as perky and adventurous as any other pig. She loves to climb underneath the bedding and poke around in everyone's business. She is fast and wiggly and has a very beautiful, mild-mannered disposition. Backstory: I rescued her and her daughter from a very abusive pet store manager. She had birthed a litter of five, with only one survivor, and was in a horrid state. Personality: She is a wiggly guinea pig that doesn't like to be handled. She has become a lot more confident and more energetic since her rescue. She is a sweet girl that doesn't like to cause trouble, and spends her days munching on hay or relaxing near another guinea pig. Backstory: She is Renée's daughter, the only survivor of the litter. When I met her she was 4 weeks old but smaller than the average newborn and, like her mother, she was in a horrid state. Personality: She is a very charismatic little lady, choosing to either waddle or bounce to her destination. She loves to popcorn and zoom around. She has a lot of sass, especially when her eyebrows have grown out, and has quite a voice on her. She is curious and will investigate anything and everything going on. Backstory: She and her sisters were surrendered to a rescue due to the owners losing interest. They remained there for over a year before I could not resist adopting them. Personality: She is a sweet and friendly girl with a beautiful personality. She loves cuddles, both with humans and other guinea pigs. She is more akin to a dog, whining and licking and climbing into your lap for attention. She is quite a sickly pig but she never lets it get her down. She is curious and full of life. Personality: She is a super curious girl and is straight on the scene as soon as there is movement outside the cage. She is a very friendly pig that gets along with everyone she meets. She is quite clever and has taught herself and the others how to beg on hind legs for food. Backstory: She and her sister Emu were born to Primrose through the Wheektown shelter, part of the Glen Innes rescue. Dia showed on neither x-rays nor ultrasounds in the womb and was a surprise baby, so she was named after the habitat of the night parrot, one of the most elusive animals in the world. Personality: She is an extremely curious girl and somewhat of a brat. She loves chin rubs. She also likes climbing things - be it furniture or guinea pig - and has taken the nickname Goat. She was a bundle of energy that loved nothing more than sprinting around the cage and investigating what others were doing. She had no concept of personal space and regularly climbed into occupied houses for a snooze. She was a very affectionate guinea pig that loved cuddles and who would follow you around demanding attention. She was so rambunctious and fearless that her nickname was Blossiraptor. She was an attractive little lady that survived everything life threw at her, even aggressive mammary cancer. In the end she succumbed only to depression after Cookie died. She was a very chill little lady that would follow Blossom wherever she went. She loved cuddles and even trained my mum to give her tomato at the ring of a bell. She also enjoyed destroying the garden that I tried to grow for them. She was a sweet and bubbly little girl that was dealt a terrible hand in life. She passed away only two weeks after getting her due to pseudotuberculosis, which she and her sister had gotten from uncaring backyard breeding practices. The enclosures at Wheektown have changed dramatically over the past couple of years. It originally started as a 2x8 C&C cage which was home to Cinnamon and her three daughters, Puffie, Latté, and Tango. Unfortunately the girls hit puberty and become very aggressive, and nothing I did would abate their hatred for each other. They were separated each into 2x2s while I worked out what to do. I consulted with their veterinarian and some rescues, and decided the best course of action was to get a neutered boar to keep them in line. I had come across Keppie online and fallen in love with him, so again we made the 6 hour drive to Queensland. He appeared to do his job and everybody got along perfectly. I also met Ella, who integrated wonderfully into the group, so I adopted the both of them. Upon returning home and seeing them frolick together happily, I thought that the nightmare was over. But the bliss only lasted a few days before they began fighting again. I was at my wit's end, and shifted the house around so I could give them extra room. They now had a joined enclosure of two 2x6s, two 2x2s, and one 1x2. Surely this would be enough room to let them live without annoying each other. Unfortunately, again, I was wrong. So I sectioned off areas of the cage and added another 2x4 to the floor. I managed to pair up Cinnamon and Ella, and Tango and Keppie. Puffie and Latté had to remain single. I was desperate to find compatible friends for Latté and Puffie. I couldn't afford another trip up to Queensland to the nearest shelter so, despite my dislike in doing so, I went to the pet store. There I met Vera and negotiated a trial period to see if she made a suitable companion. For a little while it appeared that Vera and Latté might work, but it didn't last long. I didn't have the heart to return Vera because of her crippling anxiety, and so I kept her; now I had three single guinea pigs that, despite my best efforts, I couldn't pair. At some stage Tango attacked Keppie and so I swapped her with Latté. A short while later I visited a friend who worked at the pet store. She was looking after two guinea pigs. I brought Puffie, Vera, and Tango over to see if any of them got along with them. 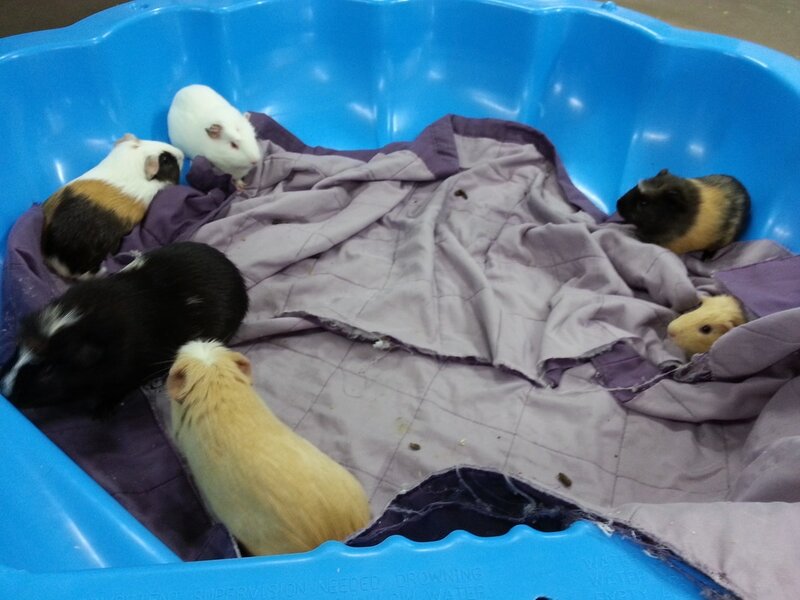 I had no success but the guinea pigs were in such bad shape that, like with Vera, I didn't want to leave them behind. So, after a two week battle, I succeeded in buying Renée and Mireya from the abusive pet store manager. 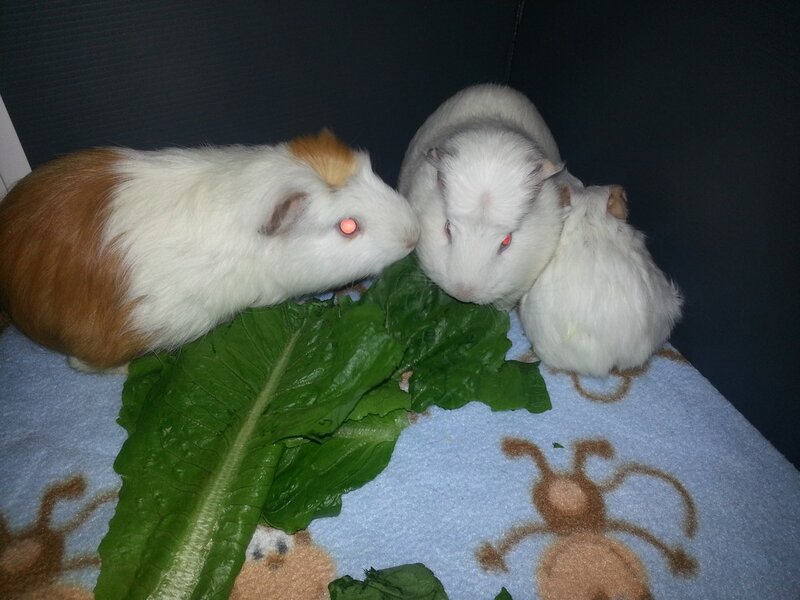 It ended up being not just a good move for the two abused guinea pigs, but for Vera and Tango as well. I introduced Vera to Renée and Mireya and they became the best of friends. Their support helped Vera cope with her anxiety and improved her life immeasurably. It took much longer but I eventually managed to integrate Tango into that group as well. ​I moved and rearranged the enclosure to span the wall, creating a two-storey 2x10 C&C cage. The top storey was split in two with dividing grids. Keppie and Latté shared one side and Cinnamon and Ella the other; Renée, Vera, Tango, and Mireya occupied the bottom. Puffie stayed in the floor cage on the other side of the room. 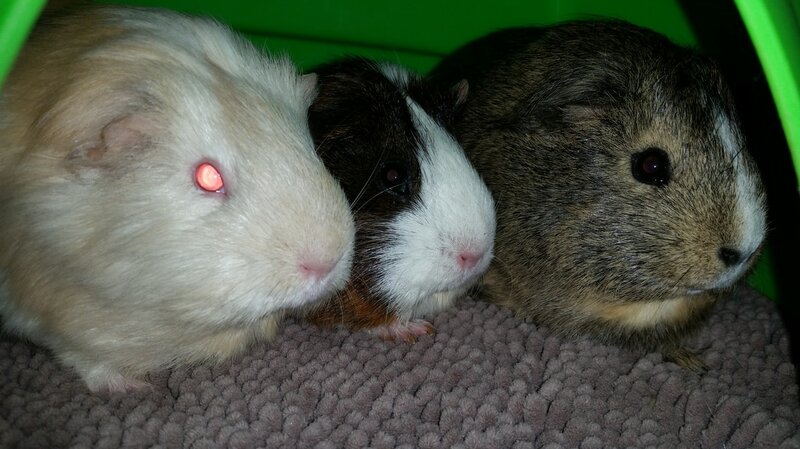 ​Eventually I successfully joined Cinnamon and Ella with the quadro group. The six girls - Cinnamon, Ella, Tango, Renée, Mireya, and Vera - then lived in the bottom storey while Latté and Keppie remained up the top in one section and Puffie in the other. At the end of the year I came across Juniper, Nutmeg, and Olive and so, while travelling to Queensland for holiday, couldn't resist adopting them. 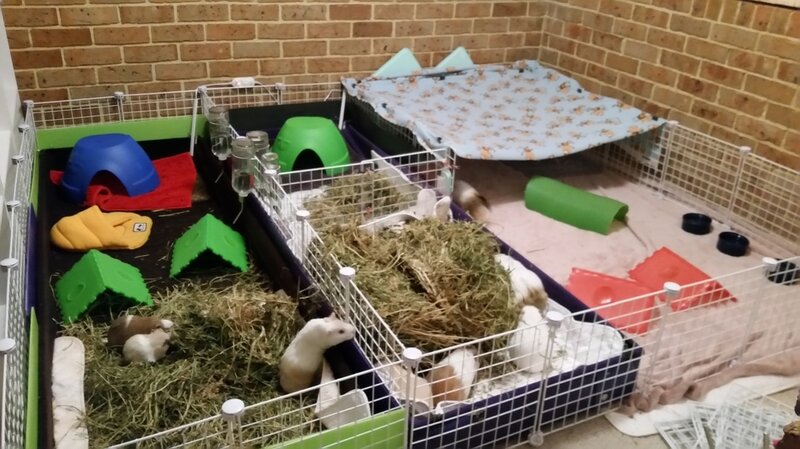 They lived in the floor cage for a short while until we moved house - I wanted to give the guinea pigs more room and try to get them all together, so we searched for a bigger house that would make that possible. 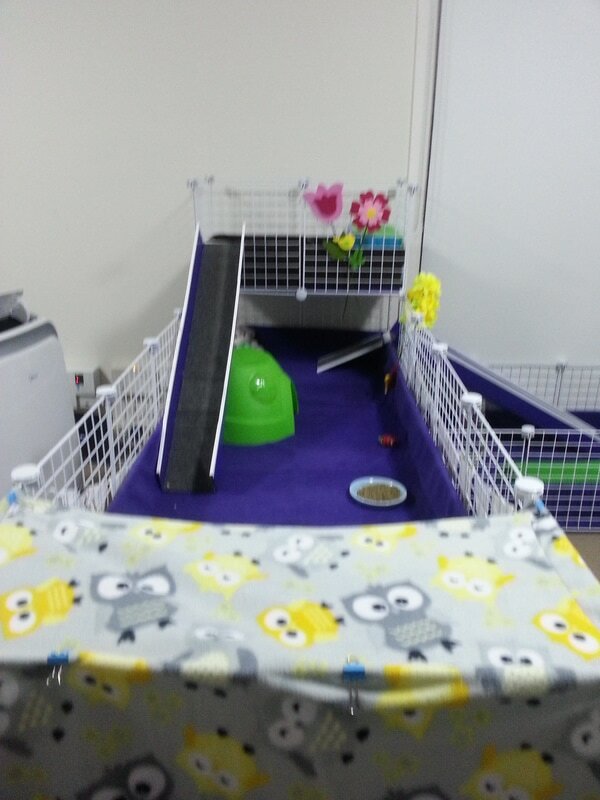 The guinea pigs got their own room at the new house. 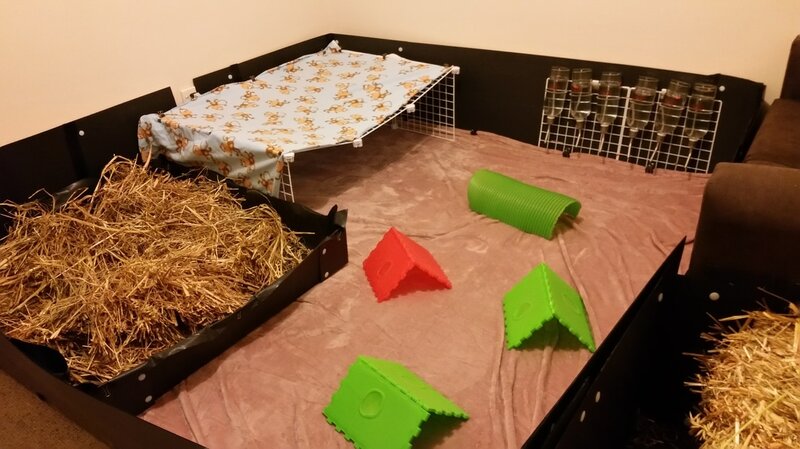 I built a cage from corflute that encompassed a 50 sq ft fleece area, a 15 sq ft hay area, and a two-seater couch. I used large incontinence pads as bedding. They got off to a rocky start but I let them sort out their dominance issues without intervention. After about three days they settled down and my beautiful herd of twelve guinea pigs was living together harmoniously. It was at this point I dubbed it Wheektown. Halfway through the year I rebuilt the cage. I made it a bit smaller, but it was easier to maintain and I was able to access the cupboard without walking through the cage. It was about 49 sq ft, including the hay loft. Due to the square shape I could use a fleece blanket for bedding, and the shelter floor was completely heated. 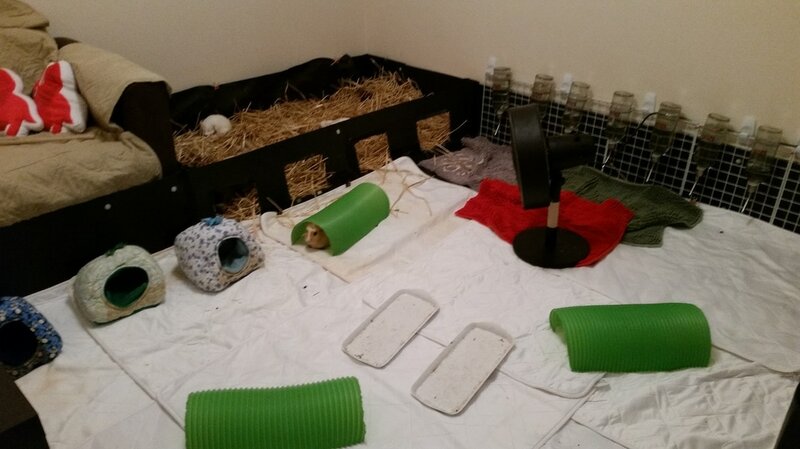 After I began taking in rescues and boarders, I cleared out the spare room and turned it into a second guinea pig room. I used the two 2x6s from the cage at the old house for the rescue or boarding guinea pigs. These cages had Piggy Bedspreads as their special fleece bedding. However, when pushed together there was another 6x3 space that I could utilise if I needed more room. In this case I used the incontinence pads, the fleece blankets, and the grids to create makeshift cages.